Downtown Lubbock is home to art galleries, live music venues, local dining and one-of-a-kind venues like The Legacy Event Center. As a proud neighbor in downtown, the historic building provides their clients with the modern conveniences of a venue, a local art display and contributes to the local community. 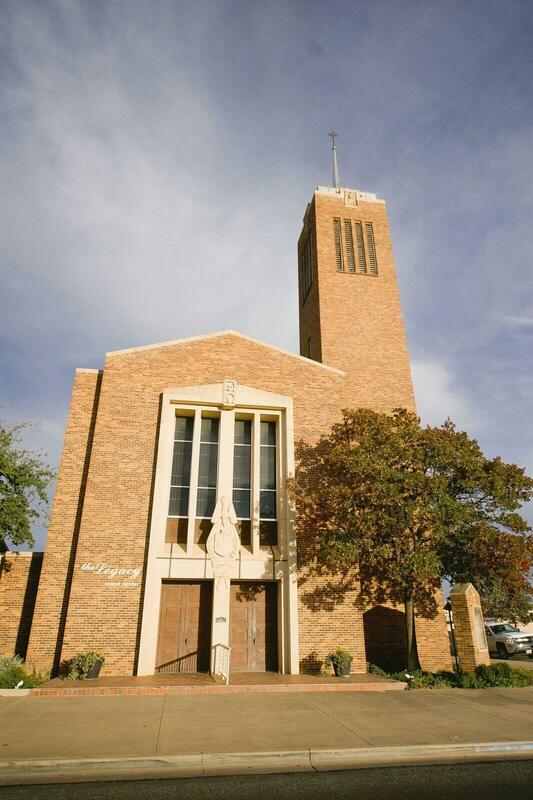 Originally the First Presbyterian Church, the location was purchased in 2006 by the YWCA and became the Legacy Event Center. After extensive renovations in 2008, the center preserved the architectural character of the church and created a beautiful backdrop for events of all sorts such as weddings, seminars, social gatherings, lunch meetings and more. From a Franklin Graham rally with an audience of approximately 400 people to a training for United Airlines employees, the venue hosts groups of all purposes. The venue offers seven rental areas including Talkington Hall, the Ballroom, the Parlor, the Atrium, two meeting rooms and a board room. Talkington Hall can seat 350 guests while the Ballroom can accommodate up to 200 people. For smaller parties or business meetings, the Parlor and Atrium can accommodate 50 people each. Named by the Lubbock Avalanche Journal as Best of Lubbock Wedding Venue for 2016 and 2017, The Legacy prides itself in their ability to customize any wedding to the personal style of the bride and groom. When renting the venue for a wedding, the rental cost comes with 25 tables and tablecloths, Wi-Fi, one security guard, an event coordinator and includes set up and break down. The event coordinator sees to the details during the planning process and on the day of the event. Planners don’t have to worry themselves about weather as the entire venue is indoors, allowing for guests to easily make their way from the ceremony to the reception. On site, guests can enjoy art work as they make their way through the venue. With an open vendor policy, the venue only requires for the caterer to be licensed. Caterers can utilize the onsite commercial kitchen for an additional $200, opening January 1, 2018 or the caterer’s kitchen, which is included in the rental and features prep-tables and a refrigerator. When booking an event at The Legacy Event Center, planners are able to give back with a portion of the rental fee going to YWCA of Lubbock supporting nearly 2,000 children throughout the community. The venue supports the YWCA through Why Care Facilities program, which hires college students to serve in after-school care Monday through Friday from 7 a.m. – 6:30 p.m.
Curator Emily Sharp, director for The Legacy Event Center, works in conjunction with the West Texas Watercolor Society for the art gallery. Sharp noted that she likes keeping a rotating exhibit featuring seasonal work. The venue is also involved in the Lubbock Arts Alliance and First Friday Art Trail. To book an event at The Legacy Event Center, contact the Xandria Lorenzo or John Bewley, both of which are event coordinators, at 806.687.8854. All photography featured in this blog is credited to Lissa Anglin.